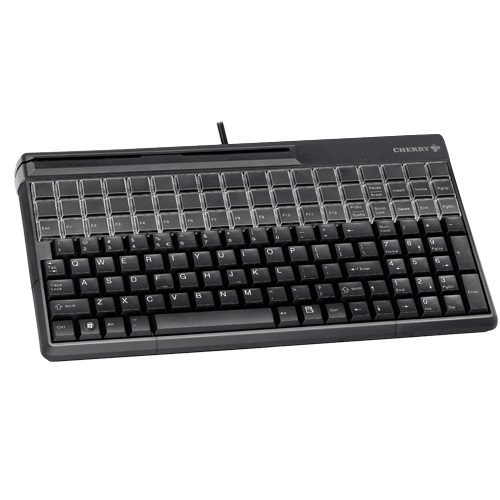 CHERRY SPOS G86-61410 - Black 14" USB keyboard with 3-track magnetic stripe reader. US 135 position key layout with 32 additional keys. 135 programmable and 54 relegendable keys. Includes 'Cherry Tools' configuration software and UPOS drivers. Cherry SPOS 61410 Programmable Qwerty Keyboard with MSR. The connection type is USB and colour is Black. Black 14" USB keyboard with 3-track magnetic stripe reader. US 135 position key layout with 32 additional keys. 135 programmable and 54 relegendable keys. Includes 'Cherry Tools' configuration software and UPOS drivers.